This luxurious 100-acre estate is located on the west bank of the River Moy and situated perfectly for exploring the Irish coastline called The Wild Atlantic Way. Guests have a plethora of outdoor activities, including archery, fishing, clay pigeon shooting, golf, and much more. 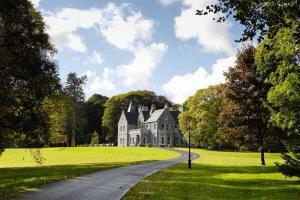 This elegant estate has become known as the most romantic house in Ireland. Accommodations include deluxe rooms, superior rooms, suites, and luxury woodland lodges. Located on the banks of the River Moy in Co. Mayo. The Kitchen Restaurant - Meat and Seafood, The Boathole Bar. Clay Pigeon Shooting, Archery, Fishing, Biking, Golf, Hawk Walk, Wild Atlantic Way.